Podcast Episode 35 is here! You can listen to or download it on Apple iTunes, Google Play, our website and Soundcloud. In this episode we welcome back Kevin Crowe of giveamile.org. Give A Mile should be well known to many of our readers now and it's great to have him back on the show. 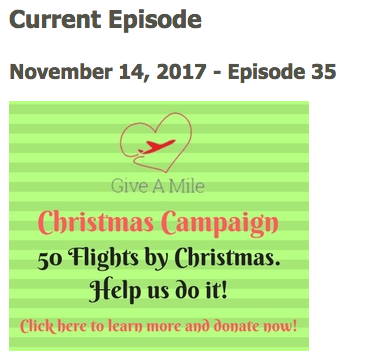 Kevin discusses what Give A Mile is all about and tells us about their Christmas Campaign where they want to raise enough miles or cash to donate 50 flights of support! Negative changes coming to the BMO Rewards and AIR MILES World Elite Mastercards?